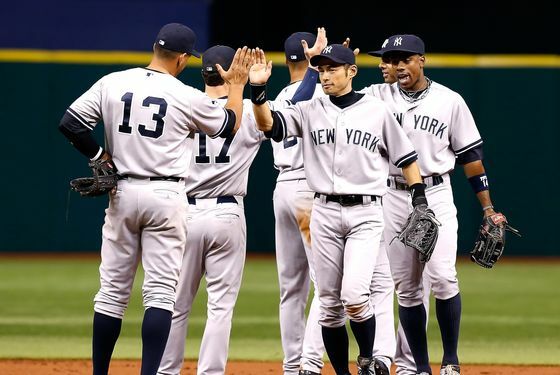 Two nights ago, we caught a couple innings of the Yankees-Rays game on the radio, and if we may paraphrase a bit, John Sterling and Suzyn Waldman were talking about how they don't know what people mean when they question whether a baseball team is panicking. We assume the duo meant that players don't react to losing streaks by, like, running around the clubhouse and flailing their arms like the room was on fire. But there are other ways that can manifest itself, like a team's hitting coach claiming that guys who generally don't bunt might need to start doing so. (Joe Girardi, thankfully, dismissed that idea.) Less drastic measures have been taken, though: He insisted it wasn't superstition, but it hardly seems like a coincidence that David Robertson, known for exposing his high socks, entered the game with his uniform pants covering up his calves and ankles last night. (This a day after the Yankees tried sending Eric Chavez out with the lineup card in a failed attempt to change their luck.) The Yankees themselves might not be in panic mode, but the need to reverse their current path was apparent. And last night, for one game at least, they did. And so, the Yankees tonight will begin a four-game series in Baltimore with a one-game lead over the Orioles and a two-and-a-half-game lead over the Rays, whom the Yanks beat last night, 6-4. There should be a nice atmosphere at Camden Yards for these games: Unlike this past series at Tropicana Field (where the stadium was at less than half-capacity for two of three games), the Yankees can expect to play in front of some huge crowds at Oriole Park beginning tonight. Via the Times yesterday evening, the Orioles were expecting crowds of more than 40,000 for each of the four games, with just standing-room tickets remaining for tonight's game (in which the team will unveil a statue of Cal Ripken) and Saturday's game. Yankees-Orioles games at Camden Yards always draw loads of fans from New York, but it's been a while since the hometown fans have had a chance to attend a meaningful, late-season series between these teams. As someone who's attended many Yanks-O's games in Baltimore over the last decade, we expect Orioles fans will be a little more enthusiastic this weekend than they have been for these series in recent years. The Yankees, who once had a double-digit lead in the division, didn't want their September to be this interesting, but here we are. They can undo some of the damage of the past week with a strong series in Baltimore, just as Baltimore can leapfrog their rival with a series win of their own. David Phelps pitches for the Yankees in the opener tonight against Jason Hammel.